We’d love your help. Let us know what’s wrong with this preview of Dark Screams by Brian James Freeman. Stephen King, Kelley Armstrong, Bill Pronzini, Simon Clark, and Ramsey Campbell are the first contributors to a mind-bending new series of short-story collections that push the boundaries of horror and dark suspense to the bleeding edge. From Brian James Freeman and Richard Chizmar of the acclaimed Cemetery Dance Publications, Dark Screams: Volume One reaches across genres Stephen King, Kelley Armstrong, Bill Pronzini, Simon Clark, and Ramsey Campbell are the first contributors to a mind-bending new series of short-story collections that push the boundaries of horror and dark suspense to the bleeding edge. From Brian James Freeman and Richard Chizmar of the acclaimed Cemetery Dance Publications, Dark Screams: Volume One reaches across genres to take readers beyond the precipice of mortal toil and into the glimmering void of irreality and beyond. Edward James Tolliver has found a weary sort of asylum among the insane. He knows he’s not one of them—but how can he tell anyone about the invaders without sounding that way? To ask other readers questions about Dark Screams, please sign up. This anthology consists of short stories by Stephen King, Kelley Armstrong, Bill Pronzini, Simon Clark and Ramsey Campbell. How could a reader go wrong? The Stephen King story "Weeds" was part of the movie Creepshow. This is the one in which the King himself starred, where the meteor fell to earth in the man's backyard. In the movie, I thought the tale was hokey, but in the book I liked it more. We are privy to more of Jordy's inner thoughts, which makes it funnier, but at the same time, sadder. This anthology consists of short stories by Stephen King, Kelley Armstrong, Bill Pronzini, Simon Clark and Ramsey Campbell. How could a reader go wrong? 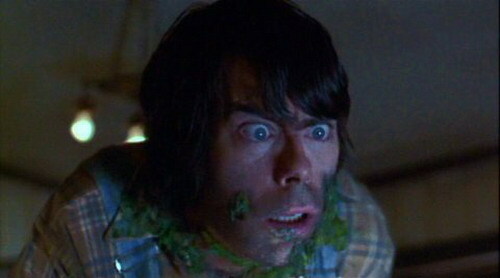 The Stephen King story "Weeds" was part of the movie Creepshow. This is the one in which the King himself starred, where the meteor fell to earth in the man's backyard. In the movie, I thought the tale was hokey, but in the book I liked it more. We are privy to more of Jordy's inner thoughts, which makes it funnier, but at the same time, sadder. All the stories in this collection were pretty good, but I enjoyed the Pronzini tale, "Magic Eyes" the most. In my mind I called it the Diary of a Madman. There are only 5 shorts in this collection, so it can be read in no time at all. You won't find anything here to blow your mind, but these tales are well written, fun to read, and a great way to kill a winter afternoon. Recommended for fans of short story collections and dark fiction! I received a free ebook copy from Net Galley in exchange for an honest review. This is it. Dark Screams is a collection of short stories from various authors. One of those authors would be Stephen King, and he's one of my favorites. I tried my best not to be biased about the novel just because he wrote one of the short stories, and in the end, his story was not even my favorite of them all. There were 5 short stories, and 4 of them were really great short reads. The only bad one would be The Watched. I didn't enjoy it at all. Flat characters and boring plot. My favorite though would have to be Murder in Chains. It was the most exciting one and I even felt sorry for the main character. The other 3 were also good reads. This would be the very first "anthology" that I really enjoyed. I can't wait for volume 2 [if ever there will be one]. As with most anthologies, I felt that some of the stories were very good and some I wish I had skipped. I originally sat down to read a romance novel the night I read this book but I realized that I was not in the mood to read romance so I decided to start on this book of horror short stories i Now Available! As with most anthologies, I felt that some of the stories were very good and some I wish I had skipped. I originally sat down to read a romance novel the night I read this book but I realized that I was not in the mood to read romance so I decided to start on this book of horror short stories instead. These stories are very short with the entire book being only around 100 pages so the authors really do not have a lot of time to develop the stories. I really liked the Stephen King and Kelley Armstrong stories. 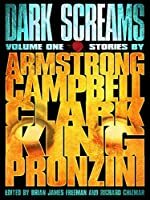 I thought that Bill Pronzini's story was okay but I didn't enjoy Simon Clark or Ramsey Campbell's at all. I noticed that this story was originally published in 1976 before starting the story. That did not change my enjoyment of the story but just a warning that you may have already read this one to all the King fans out there. I am very new to reading Stephen King and have exactly one book under my belt right now and I found that I really enjoyed this short story. I felt that this story really should be classified as science fiction rather than horror. I have always wanted to read Kelley Armstrong's work so I was eager to read this short story and it turned out to be one of my favorites in the book. It was the story of two young women who have been friends since they were small children. The way this story ended was really surprising to me. I am convinced that I need to read more of Armstrong's work. This story was told as journal entries of a man in an insane asylum. I really liked having the story told in such a unique manner. I think that the author was able to write the paranoia the main character felt quite well. This story was not one of my favorites. It was about a man who finds himself chained to a murderer. I did not understand the point of the story and to be honest felt a bored while reading it. There was a lot of action in this one but it was not for me. I fell asleep reading this short story....twice. It is about a young boy living with his grandmother who is asked to watch his neighbors. I found this story to be quite boring. I have a severe love/hate relationship with anthologies. Unfortunately, I also have a severe weakness for horror thereby resulting in a trigger happy request thumb. Only one story in this book piqued my interest - Weeds, by Stephen King. Which, was published in 1976 for the first time and so is extremely well known and, well, old. Uncle Stevie himself played the role of Jordy in the Creepshow movie rendition. Fun little fact there for ya, since I have nothing really positive to say about the ot I have a severe love/hate relationship with anthologies. Unfortunately, I also have a severe weakness for horror thereby resulting in a trigger happy request thumb. Fun little fact there for ya, since I have nothing really positive to say about the other stories. The rest were kind of snooze inducing and luckily the book was pretty short. Dark Screams: Volume One is the first volume in a series of short-story collections. The short-stories featured in this particular collection are listed in order below along with their authors and my review. I gave the collection a rating of 4.10 stars, as averaged from my individual ratings below. Loved this sci-fi themed horror story that very much feels like an old-school twilight zone episode. And it’s Stephen King! Enough said. 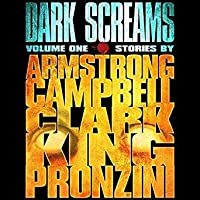 ★★★★ Dark Screams: Volume One is the first volume in a series of short-story collections. The short-stories featured in this particular collection are listed in order below along with their authors and my review. I gave the collection a rating of 4.10 stars, as averaged from my individual ratings below. Very involved for a short-story. Dark, mysterious, engaging, thrilling... and with a surprising twist at the end. I liked it! Loved this take on the mind of someone placed in an insane asylum. I felt like I was going a little bit crazy right along with him! For some reason, I experienced a bit of trouble consistently following this short story, but the ending definitely yelled “horror” loud and clear. Pretty freaky! Dark Screams: Volume One, is a collection of five short stories, edited by Cemetery Dance's Richard Chizmar and Brian James Freeman. Each author presented had a unique voice, and stories that were all well worth reading. --"Weeds", by Stephen King (4 stars): I remember the movie adaption of this one well, but reading it was even better! The little, subtle touches like the "sounds" of growing really helped add to the atmosphere of confused terror. --"The Price You Pa Dark Screams: Volume One, is a collection of five short stories, edited by Cemetery Dance's Richard Chizmar and Brian James Freeman. Each author presented had a unique voice, and stories that were all well worth reading. --"The Price You Pay", by Kelley Armstrong (4.5 stars): Strong, emotional story that took an unexpected direction. --"Magic Eyes", by Bill Pronzini (3-3.5 stars): A glimpse into the mind of a psychiatric inmate. --"Murder in Chains", by Simon Clark (4.5 stars): Great, suspenseful tale that came from out of nowhere! --The Watched", by Ramsey Campbell (4 stars): Very atmospheric tale, as expected from Campbell. Review of Dark Screams: Volume One by Brian James Freeman An admitted horror addict, I couldn’t wait for Dark Screams: Volume One to come out and thanks to NetGalley I didn’t have to wait all that long. I have a love/hate relationship with horror anthologies, and this one was no different for me. I really loved Weed’s by Stephen King and it was everything I have come to expect from his stories. The Price You Pay by Kelly Armstrong had a strong storyline and a satisfying ending, in my opinion. I Review of Dark Screams: Volume One by Brian James Freeman An admitted horror addict, I couldn’t wait for Dark Screams: Volume One to come out and thanks to NetGalley I didn’t have to wait all that long. I have a love/hate relationship with horror anthologies, and this one was no different for me. I really loved Weed’s by Stephen King and it was everything I have come to expect from his stories. The Price You Pay by Kelly Armstrong had a strong storyline and a satisfying ending, in my opinion. I enjoyed Magic Eyes by Bill Prozini but I have a penchant for crazy people and especially ones in loony bins. Murder in Chains was a decent slice of a story, although it felt to me like it was taken from the middle of a story and the randomness of it took away from the horror. I did not care for The Watched by Ramsey Campbell at all; the plotline and the writing both were underwhelming and the story seemed kind of pointless. Overall I am giving this volume 4 stars, as there was more good in there than bad. Dark Screams includes some very big names in the horror industry and I am very much looking forward to reading the coming volumes. I received Dark Screams: Volume One as an e-ARC from Netgalley in exchange for my honest opinion and that’s what you’ve got. Dark Screams - Volume One - Available now through Amazon.com. Meh. An anthology of five previously published short stories. The formatting left something to be desired, too. I think that saying sums up this little anthology of horror stories fairly well. It's not a big book, weighing in under a hundred pages, but it's ten pounds of darkness in a five pound bag. Okay, okay, I'm getting a little too crazy with the metaphors too early. Kicking off the fun is Stephen King, probably a guy who is as good at writing a short story as he is famous for writing his novels. "Weeds" may not be at the It's not the size of the dog in the fight, it's the size of the fight in the dog. Kicking off the fun is Stephen King, probably a guy who is as good at writing a short story as he is famous for writing his novels. "Weeds" may not be at the tippy-top of King's best short works, but if you enjoy the more monstrously weird tales he's come out with over the years, like "Battleground" for instance, then this tale of a fella freaking out over a pernicious fungus in his yard should be right up your alley. One of the more viscerally charged stories was Kelley Armstrong's "The Price You Pay." While the narration is somewhat cut-and-dry, the wallop at the end delivered and psycho thrillers seem to me like a hard thing to pull off in short fiction a lot of the time. This one does a real good job of it. A couple notable stories from Bill Pronzini and Simon Clark, whose novels I keep meaning to read, appear as well. And then things are capped off with the legendary Ramsey Campbell. This one just harkens back to one of the most tried-and-true setups in horror, that being the child and the elderly guardian and the thing that goes bump in the night. From that, there's a million ways to spin the tale, and Mr. Campbell does a heckuva job doing it here. Dark Screams: Volume One is a very good collection of stories by five very good writers and edited by Richard Chizmar and Brian James Freeman. The first was Weeds by Stephen King I gave 4 stars. The second was The Price You Pay by Kelley Armstrong I gave 3 1/2 stars. The third was Magic Eyes by Bill Pronzini my least favorite I gave 3 stars. Fourth was Murder in Chains by Simon Clark my favorite I gave it 4 1/2 stars. The fifth was The Watched by Ramsey Campbell I gave 4 stars. I'm not a real bi Dark Screams: Volume One is a very good collection of stories by five very good writers and edited by Richard Chizmar and Brian James Freeman. The first was Weeds by Stephen King I gave 4 stars. The second was The Price You Pay by Kelley Armstrong I gave 3 1/2 stars. The third was Magic Eyes by Bill Pronzini my least favorite I gave 3 stars. Fourth was Murder in Chains by Simon Clark my favorite I gave it 4 1/2 stars. The fifth was The Watched by Ramsey Campbell I gave 4 stars. I'm not a real big fan of short story collections by I did enjoy reading this one and would recommend it. I looking forward to the next one in this series. I gave this anthology 4 stars. The Stephen King story was all sorts of fun and the Ramsey Campbell story was highly entertaining too. I very much enjoyed this eclectic mix of horror and suspense shorts edited by Brian James Freeman and Richard Chizmar. I will resist the urge to review the individual stories, but will say that each of these shorts had its own voice and each tale was enjoyable in its own way. Highly recommended for a quick read with good mix of authors and writing styles. I am looking forward to more volumes in this series. "Murder in Chains" by Simon Clark was definitely my favorite story out of this collection. It's also my first time I read anything by him, so it left a great first impression. I loved it. Short horror stories. Really got me hooked on second-forth stories. Followed the writers as well, they seem a bit under rated though. Anyway. If you’re short on time and and enjoy horror, this is the book for you. Why not 5 stars? Because the fifth story was meh. Dark Screams, Volume One collects five short stories, making this small anthology a fairly breezy read, but an ultimately disappointing collection. Up first is Stephen King’s 1976 story, Weeds, which was the basis for “The Lonesome Death of Jordy Verrill” in George Romero’s horror film anthology Creepshow. Here, we witness a meteor crashing on Jordy Verrill’s farm and splitting open to spill a strange, white substance upon the ground. Jordy, a rather dim sort, touches the substance and awakens the next morning to find a moss-like growth on his fingers. Over the course of the story, he is slowly consumed by this alien breed of plant. It’s a quick one-and-done kind of story, but not particularly deep and it runs a path that is pure straight-and-narrow. The final segment sets up a chilling final scene, but not one that is particularly shocking or surprising. For me, it’s a notable work only because it is a chance to read a very early King story that I wasn’t familiar with, but not one that I found overly impressive as a whole. There’s a natural narrative drive to the story, though, and it ends the only way possible, albeit in a rather familiar, and now well-trod, horror trope. Still, my first impression of this story is merely that it felt rather quaint. Good, certainly, but quaint. While I didn’t find myself quite enamored with Kelley Armstrong’s The Price You Pay, a small revenge thriller revolving around the cycle of bad choices, I rather enjoyed Magic Eyes by Bill Pronzini. I’m a bit of a sucker for madhouse psychological horror, and Pronzini delivers. The story is told via the journal of a patient, who writes with a felt tipped pen. I really liked the way the narration slipped into the occasionally mysterious, mad rant and the ways anger bled through the pages with frantic, run-on sentences. There was a terrific sense of voice here, and Pronzini hooked me early and kept my attention throughout. Simon Clark’s Murder in Chains was another one that I enjoyed, but I wasn’t quite satisfied with the resolution of the central mystery. The story involves a Leeds journalist wakening in an underground crypt and chained to an angry killer. It’s an adequate slice of the moment piece, but lacks any background or answers regarding the central premise. The anthology ends with Ramsey Campbell’s The Watched, the only story in this collection that I actively disliked. I found this story to be dull, lifeless, and pointless, to the point that I broke down and skimmed through the last few pages to hit the end. Dark Screams has a little something for everyone. I believe you will recognize some of these names. Jordy Verrell was the first one to reach the meteor. It was better than fireworks. He doused it with water and it broke apart. Uh oh. He wasn't the sharpest tack in the box. He had a bad feeling about what' s inside and so did I. I love Stephen King's writing. He comes up with come creepy and original ideas. I have most of his books and I am always eager to see what he comes up Dark Screams has a little something for everyone. Murder in Chains by Simon Clark. The Watched by Ramsey Cambbell. I enjoyed the collection and would read more of the Dark Scream anthologies. DARK SCREAMS is the first volume in what for me is a highly anticipated set of anthologies by well known authors to be sold at a very reasonable price. Volume One brought us a Steven King classic from 1976 not seen in print since his days of Cavalier magazine. It was however made into a movie. Since I had never actually read this story - WEEDS - I was more than happy yo settle in and read it for the first time. I had pictures of Jordy in my head, and that was just fine with me. How can you give c DARK SCREAMS is the first volume in what for me is a highly anticipated set of anthologies by well known authors to be sold at a very reasonable price. Volume One brought us a Steven King classic from 1976 not seen in print since his days of Cavalier magazine. It was however made into a movie. Since I had never actually read this story - WEEDS - I was more than happy yo settle in and read it for the first time. I had pictures of Jordy in my head, and that was just fine with me. How can you give classic King anything less than five stars? I call that G-O-O-D.
Bill Pronzini brought us MAGIC EYES, a story in an insane asylum. My followers know that asylum stories are my weak spot and I devoured this one. Pronzini didn't disappoint, this was a well written short story with the oomph at the end. MURDER IN CHAINS by Simon Clark was enough story to whet your appetite more. Was this part of a longer novel? I certainly wanted more! Excellent. Ramsey Campbell's THE WATCHED provided a satisfying finish with his classic storytelling style. Each one of these was satisfying in it's own way and different in style and category of dark fiction. There's something for everyone and I highly recommend it for all lovers of dark fiction. I am going to start by saying I bought this ebook because of a facebook post that said something about letting Stephen King read you a bedtime story. Who wouldn't want that? I was a little irritated when I realized this was NOT a newly published short story, but one I've read many times before. I quickly got over that because not only is this recycled King a gem, but the other three stories included are also pretty good. Jordy Verrill, the only character in “Weeds”, the first story, is a staple I am going to start by saying I bought this ebook because of a facebook post that said something about letting Stephen King read you a bedtime story. Who wouldn't want that? I was a little irritated when I realized this was NOT a newly published short story, but one I've read many times before. I quickly got over that because not only is this recycled King a gem, but the other three stories included are also pretty good. Jordy Verrill, the only character in “Weeds”, the first story, is a staple for any King fan. Not only did we read it in Cavalier magazine, and other collections, but it was the second story in Creepshow, entitled “The Lonely Death of Jordy Verrill”. This is obviously a nod to Lovecraft. When a meteor hits the ground on simple minded Jordy’s farm all he thinks about is how much he can get if he sells it. Too bad that the meteor ends up giving Jordy oh so much more than a little cash. Five stars, all the way! I'm definitely guilty of being inclined to pick up any compilation with Stephen King's name included in hopes of finding a new King story. Unfortunately here the story was "Weeds", originally published in the late 1970s (it served as part of the the basis for the movie Creepshow). The other stories are "The Price You Pay" by Kelley Armstrong, "Magic Eyes" by Bill Pronzini, "Murder in Chains" by Simon Clark and "The Watched" by Ramsey Campbell and all of these four look to be new. "Murder in Chai I'm definitely guilty of being inclined to pick up any compilation with Stephen King's name included in hopes of finding a new King story. Unfortunately here the story was "Weeds", originally published in the late 1970s (it served as part of the the basis for the movie Creepshow). Dark Screams is the first short story collection edited by Richard Chizmar and Brian James Freeman. Each author brings their own unique style to the collection. Over all this was a very good collection with a great mix. My favorite story was The Price You Have To Pay by Kelly Armstrong. This was a story about vengeance with a surprising twist at the end. Looking forward to other volumes of Dark Screams. Volume One starts out with one of the most popular horror writers ever: Stephen King. “Weeds” was originally published in Cavalier, a “men’s magazine,” in 1976, and has never been reprinted until now — though it did becom Dark Screams: Volume One is the first of at least four volumes of short horror anthologies that are projected for publication through August 2015. The books are being published as ebooks only through Random House’s digital-only genre imprint, Hydra, for a bargain price of $2.99. Volume One starts out with one of the most popular horror writers ever: Stephen King. “Weeds” was originally published in Cavalier, a “men’s magazine,” in 1976, and has never been reprinted until now — though it did become a part of the movie “Creepshow,” with King himself playing the role of Jordy Verrill. Jordy is the protagonist of “Weeds,” a not particularly intelligent man who farms a spread situated on Bluebird Creek in New Hampshire. He’s alone at twilight on the Fourth of July when a meteor flashes overhead. It lands close enough that Jordy feels the thump in his feet, and his eyes light up with dollar signs. Those fellows at the college might pay good money for this thing, he reasons. The meteor cracks in two when he pours water on it to cool it down, and there’s white flaky stuff coming from the center. He burns his fingers badly when he tries to touch the white stuff, but he treats them with burn ointment and goes to bed. When he wakes, he feels like he’s got the flu — and then he sees what’s growing out of those burned fingers. Things go from bad to worse for Jordy from there. In fact, things may be going badly for everyone on earth from that point. It’s vintage King, written in his transparent prose and getting more horrific — or at least grosser — with every subsequent paragraph. King has written better work, no doubt, but finding this story is like coming across an extra chocolate truffle you didn’t know you had. “The Price You Pay” by Kelley Armstrong is about Kara’s friendship with Ingrid. The friendship began in childhood and lasted throughout the girls’ early teen years. They separated in their late teens, and Kara married Gavin and had a child. Now Ingrid has once again appeared, and the girls have resumed their friendship, though Kara is not so eager for Ingrid’s company as Ingrid is for hers. Still, the two young women go out drinking on the night of Kara’s 21st birthday, only to become too intoxicated to drive home safely. While they wait for Gavin to rescue them from a dark country road, they are abducted. While Kara is being beaten by a hooded assailant in a dark basement, we learn of her past, and why she and Ingrid parted company. Soon we begin to question everything we’ve learned so far. Armstrong plays out her plot thread by thread until all of our expectations are turned around. Bill Pronzini gives us a first-person protagonist in “Magic Eyes” who swears he’s not crazy and that he did not kill his wife. When a story starts with that information, you know you’re in for something special, and Pronzini doesn’t disappoint. The work we’re reading is the protagonist’s journal; Edward Tolliver, its author, is writing it on his doctor’s suggestion, but he’s sure that the doctor will be reading it despite his assurances of privacy. So he drops the occasional line about “magic eyes” or “invaders,” trying to smoke out the doctor. It is only when he concludes that the doctor isn’t reading his journal that Tolliver writes about what really happened that night his wife died. Pronzini’s protagonist is obviously intelligent; and just as obviously . . . well, but that would give too much away. The journal is the perfect mechanism for telling this story, giving us a close-up view of how Tolliver’s mind operates. Tolliver is a finely drawn character, and this story features the best characterization in the anthology. Simon Clark’s “Murder in Chains” never explains itself. We never learn why the first person narrator wakes up in an underground vault chained to another man by a ring around his throat. All we know is that the man at the other end of the chain radiates brutality, and behaves as if the narrator doesn’t even exist as he tears about the vault until after he’s killed a third man with his bare hands, for no apparent reason. Clark is plainly reaching for the Kafkaesque, but winds up with mere splatterpunk instead. The always reliable Ramsey Campbell takes the last position in this short anthology with The Watched. Jimmy is a 12-year-old boy who lives with his grandmother. As the story opens, he is returning from the grocery shop with a heavy bag of potatoes and getting more tired with every step. When he comes to the hide that is situated on the canal that leads to home, he dodges in to get a break, only to find that someone else is already there: a policeman, who tells him that his neighbors are dangerous drug dealers. He asks Jimmy to keep an ear out for what’s going on next door. It’s not the best idea to rely on a 12-year-old, though, and trouble inevitably follows. But more than that, someone’s been smearing his grandmother’s windows. And there’s been a sluggish dragging sound outside. What’s this all about? Campbell has a way of transforming the ordinary into the frightening, of hinting at a horror without ever showing us more than its outlines, which makes his stories all the more terrifying. It’s a fitting end to a fine anthology. Dark Screams, Volume One, promises that we’ll be getting solid anthologies for a very low price as the new year progresses. The voices we’ll be hearing from include some of the best talents the field has to offer; you’d think with King, Armstrong, Clark, Pronzini and Campbell in the first volume, the following volumes would have to fall off, but instead they promise stories by the likes of Clive Barker, Peter Straub, Robert R. McCammon, Richard Matheson and others. The stories may not be the best each of these writers has to offer, but they are definitely stories worth reading, and I’m looking forward to reading them. Dark Screams is an entertaining horror anthology and a quick read - great for the chilly weather and spooky feel of autumn. It consists of 5 short stories. My favorites were Weeds by Stephen King and Magic Eyes by Bill Pronzini. Even in just a few short pages, the character development was spot-on. As for the other 3 stories, they weren't bad by any means - they just weren't as strong. In general, this is definitely worth a read for horror lovers! Thank you to Netgalley & the publisher for th Dark Screams is an entertaining horror anthology and a quick read - great for the chilly weather and spooky feel of autumn. It consists of 5 short stories. My favorites were Weeds by Stephen King and Magic Eyes by Bill Pronzini. Even in just a few short pages, the character development was spot-on. As for the other 3 stories, they weren't bad by any means - they just weren't as strong. In general, this is definitely worth a read for horror lovers! What a great selection of stories. I admit that I first got this for the Stephen King story "Weeds", which was first found in comic form in Creepshow. But the other stories were just as good. I definitely plan to look into these other authors as well! Non-themed horror anthologies that don’t have some variation of “year’s best” in front of their title are a rare thing nowadays, so when Brian James Freeman posted that he and Richard Chizmar were editing one and looking for folks to write honest reviews, I jumped at the opportunity. Not surprisingly, these two have put together one hell of a book. The first story is “Weeds” by Stephen King, the first time it’s been back in print since the ’70s (I know this to be true, yet I feel I’ve read it bef Non-themed horror anthologies that don’t have some variation of “year’s best” in front of their title are a rare thing nowadays, so when Brian James Freeman posted that he and Richard Chizmar were editing one and looking for folks to write honest reviews, I jumped at the opportunity. Not surprisingly, these two have put together one hell of a book. The first story is “Weeds” by Stephen King, the first time it’s been back in print since the ’70s (I know this to be true, yet I feel I’ve read it before; most likely I’m just intimately familiar with it due to the film anthology Creepshow, which I’ve seen dozens of times). Jordy Verrill, a farmer in New Hampshire, witnesses a meteorite fall to earth on the 4th of July. In a rare stroke of brilliance, he decides to go collect the rock to sell to a local university, assuming it will be worth quite a bit of money. Unfortunately for Jordy, the meteorite was more than just a chunk of rock from space, and what came to Earth with it spells his doom (and possibly the doom of everything on the planet). This story is classic King. There’s a lighthearted goofiness to the whole thing that masks a much darker and more horrific heart. It’s good to see this one back in print. Kelley Armstrong’s “The Price You Pay” is a horror story that is completely grounded in the real world; it’s the kind of story you just might hear about on the news one night. Kara and Ingrid have been friends since childhood, and Ingrid has always looked out for Kara, protecting her from threats, both real and perceived. Ingrid took that protection too far, though, and both girls paid a price for it. Now Ingrid has reappeared in Kara’s life, and with her comes a new threat to both women. There was nothing too surprising in this story; you can see most every turn coming, with the possible exception of the final reveal. It is, however, an expertly-written story that will keep you glued to the page until the very end. “Magic Eyes” by Bill Pronzini tells the story of a man that has been institutionalized for murdering his wife. The protagonist maintains that he is perfectly sane and that he had to kill his wife because she had been taken over by some hostile force. I don’t want to say too much more for fear of spoiling the story. Suffice it to say that he story is a lot of fun and kept me guessing all the way through. Simon Clark’s “Murder in Chains” is my favorite story in the anthology. It’s a pretty outlandish tale of a guy that wakes up with a collar around his neck. This collar is attached to a chain, and at the other end is another collar around the neck of a large man with apparently limited intelligence but endless rage and a capacity for extreme violence. There’s no real setup for this situation, and the ending, while satisfying, doesn’t really explain why anything happened. I honestly hope that Clark one day expands on this story, either in novel form or, at the very least, with another short story. There are just so many questions left to answer! The final story is “The Watched” by Ramsey Campbell. I know the man is a veritable institution in the horror genre, but his stories have, for the most part, never done anything for me. He just seems to get bogged down in extraneous detail and I get bored waiting for the meat of the story. That said, this short story is quite good and I very much enjoyed it. It’s the story of a teen in a rough neighborhood and how a local constable recruits to him to help keep tabs on a family of suspected drug dealers. 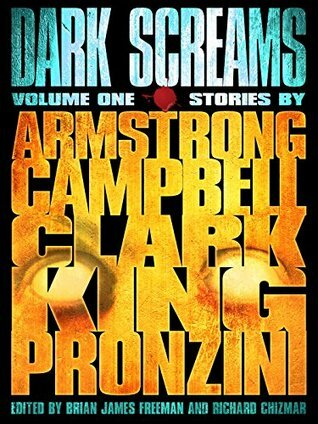 There were a number of times Campbell could have gone off on long tangents, but he reigned himself in and kept focused, and the result is a great little story that gets to the point in a reasonable amount of time, with a payoff that makes reading it worthwhile. This is a terrific start to a horror anthology series. Freeman and Chizmar definitely have their hand on the genre’s pulse and know a good story when they read it. I will be eagerly awaiting the next volume(s). Brian James Freeman sold his first short story when he was fourteen years old and his first novel when he was twenty-four. His short stories, essays, novellas, and novels have been published by Warner Books, Leisure, Cemetery Dance, Borderlands Press, Book-of-the-Month Club, and many others. His newest book-length work of fiction is The Painted Darkness, which was published in December 2010 by Cem Brian James Freeman sold his first short story when he was fourteen years old and his first novel when he was twenty-four. His short stories, essays, novellas, and novels have been published by Warner Books, Leisure, Cemetery Dance, Borderlands Press, Book-of-the-Month Club, and many others. His newest book-length work of fiction is The Painted Darkness, which was published in December 2010 by Cemetery Dance Publications. The first printing sold out on the day of publication due to the strong demand and a second printing had to be rushed.